Tony Day is a structural biologist who has worked on hyaluronan-protein interactions for the last seven years. He obtained a B.A. in Chemistry from Oxford University in 1985 followed by a D.Phil. in Biochemistry in 1988. His doctoral research focused on the structural characterization of factor H, a control protein of the human complement system. From 1991 to 1998 he worked as an Arthritis Research Campaign Research Fellow in the laboratory of Professor Iain D. Campbell (Department of Biochemistry, University of Oxford), and it was during this time that he developed his interest in hyaluronan-binding proteins. This work led to the determination of the first three-dimensional structure of a Link module, a domain found in many hyaladherins. Dr. Day is now a Senior Scientist at the Medical Research Council's Immunochemistry Unit (Oxford) and is engaged in research aimed at understanding the molecular basis of protein-hyaluronan interactions and the role of TSG-6 (an inflammation-associated hyaladherin) in extracellular matrix remodeling and leukocyte adhesion. Hyaluronan has diverse biological roles in vertebrates. For instance, it acts as a vital structural component of connective tissues,a forms loose hydrated matrices that allow cells to divide and migrate (for example during development),b mediates immune cell adhesion,c and activates intracellular signalling.d,e This wide range of functional activities may seem surprising given hyaluronan's simple structure, but results in fact from the large number of hyaluronan-binding proteins (often termed hyaladherins) that exhibit significant differences in their tissue expression, cellular localization, specificity, affinity and regulation. Characterization of the molecular basis of hyaluronan recognition by proteins, and how this is modulated in vivo, will be a key determinant in understanding the biology of this important polysaccharide. a See review by Hardingham in this series. b See review by Toole in this series. c See review by Strong and de la Motte in this series. d See review by Knudson and Knudson in this series. e See review by Turley and Harrison in this series. Many hyaluronan-binding proteins contain a common domain, termed a Link module, which is involved in ligand binding (Figure 1). The Link module (also referred to as a proteoglycan tandem repeat)1 was first described in cartilage link protein, which is comprised of an immunoglobulin domain and two contiguous Link modules. This molecular arrangement is also found in the G1-domains of the chondroitin sulfate proteoglycans aggrecan, versican, neurocan and brevican. As shown in Figure 2, aggrecan forms huge link protein-stabilized complexes with hyaluronan that provide load-bearing function in articular cartilage.a Similar aggregates, in which versican, neurocan or brevican substitute for aggrecan, are likely to contribute to the structural integrity of many other tissues, e.g., skin, blood vessels and brain. The immunoglobulin domains are probably responsible for the link protein-proteoglycan interaction, while the Link modules mediate binding to hyaluronan. Figure 1　The Link module superfamily. Chondrocyte extracellular matrix is composed of huge multi-molecular complexes consisting of an alternating array of link protein and aggrecan molecules along a central hyaluronan filament. These aggregates, some of which are anchored to the chondrocyte surface via the hyaluronan receptor CD44, provide cartilage with its load-bearing properties. Aggrecan is a proteoglycan made up of three globular domains (G1, G2 and G3) and a region where ~100 chondroitin sulfate (CS) chains are attached. The protein product of tumor necrosis factor-stimulated gene-6 (TSG-6), which contains a single Link module, is secreted in response to inflammatory stimuli (e.g., in the articular joints of arthritis patients).3 TSG-6 has been implicated in the regulation of leukocyte migration, and the pattern of its expression suggests that it is likely to be involved in extracellular matrix remodeling. For example, TSG-6 in cartilage may inhibit the formation of hyaluronan-protein aggregates, promote aggregate dissociation or modulate CD44 function (Figure 3).4,5 In certain tissue locations (e.g., during the expansion of cumulus cell-ooycte complexes), TSG-6 can associate with the inter-a-inhibitor (IaI), and this TSG-6/IaI complex may be able to stabilize extracellular matrix by cross-linking of hyaluronan chains.f Although the role of TSG-6 protein is poorly understood, its hyaluronan-binding properties, and their structural bases, are probably the best characterized of any hyaladherin (see below). f See Salustri and Fülöp in this series; O Carrette, R V Nemade, A J Day, A Brickner and W J Larsen, manuscript submitted. Figure 3　Putative roles of TSG-6 in cartilage. Figure 1 shows several new members of the Link module superfamily (i.e., stabilin-1, CAB61358 and KIA0527) that are all likely to be cell surface proteins. Stabilin-1 (accession code AJ275213) and CAB61358 (which is the accession code for this incomplete sequence) have very similar domain organizations, and the Link modules of these proteins both show about 50% identity with that of TSG-6. However, it is unclear whether or not these are hyaladherins, as no data on their hyaluronan-binding properties are yet available. The same is true for KIA0527 (accession code AB011099), which was cloned from brain tissue. As can be seen from Figure 4, there is a growing number of hyaluronan-binding proteins that do not contain a Link module. Most of these are unrelated to each other at the primary sequence level. There are few data on the positions of the hyaluronan-binding sites in these proteins, apart from the receptor RHAMM,e and therefore they will not be covered in this review. Figure 4　ther hyaluronan binding proteins. The BX7B motif is shown only for RHAMM, for which there is evidence of its involvement in hyaluronan binding. The Link module is a domain of approximately 100 amino acids with four cysteines disulfide-bonded in the pattern Cys1-Cys4 and Cys2-Cys3 (Figure 5). The three-dimensional structure of the Link module from human TSG-6 has been determined by nuclear magnetic resonance spectroscopy in solution.1 It is comprised of two a-helices and two triple-stranded anti-parallel ß-sheets (Figure 6). As can be seen from the alignment in Figure 5, many residues (including the four cysteines) are highly conserved across the Link module superfamily. There are no insertions or deletions present in regions corresponding to elements of secondary structure, apart from the bulge in the ß5 strand, and those that do occur would mainly affect the length of exposed loops. This structure therefore has defined the consensus fold for the Link module superfamily as a whole. In practical terms, this means that the TSG-6 Link module co-ordinates can be used as a template for useful modeling of other superfamily members.6,7 A good test of this is the Link module from KIA0527, which despite having an unusual arrangement of cysteine residues (Figure 5), was successfully modeled, as shown in Figure 7. Figure 5　Multiple sequence alignment of Link modules from the proteins in Figure 1. LP, link protein; A, aggrecan; B, brevican; V, versican; STAB-1, stabilin-1; 61358, CAB61358; 0527, KIA0527. All the sequences are from human except for brevican which is from rat (R). Cysteine residues are shown in yellow and other highly conserved residues (i.e., identical in 2/3 of the sequences) are denoted in pink. These residues comprise the Link module consensus sequence (CON). The position of the secondary structure elements (SS), determined for TSG-6,1 are shown below the alignment (a = a-helix, b = ß-strand, ^ = bulge). Figure 6　The Link module fold. The structure consists of two a-helices (brown) and two triple-stranded ß-sheets (yellow). Sheet I is comprised of strands ß1, ß2, ß6, while sheet II is made up from strands ß3, ß4 and ß5. Figure 7　Link modules of TSG-6 and KIA0527. The Link module of KIA0527 was modeled on the basis of the TSG-6 Link module co-ordinates1 and the pairwise alignment of these proteins from Figure 5 (A J Day, unpublished work). TSG-6 is a typical member of the Link module superfamily with disulfide bridges between consensus Cys1-Cys4 and Cys2-Cys3. In the model of KIA0527, consensus Cys-2 (residue 48) is a free sulfhydryl, due to consensus Cys-3 being absent, while the two additional cysteines (residues 43 and 63) are able to form a disulfide bond. The fact that this unusual arrangement of cysteines can be accommodated into the TSG-6 structure is a good indicator that this does represent the consensus fold for the Link module. Figure 8　The CD44 hyaluronan-binding domain. At ~160 amino acids in length, this domain consists of a Link module (blue) with N- and C-terminal extensions (green) that are linked by a disulfide bond. Residues that are essential or important for hyaluronan binding6,9 are denoted in red and orange, respectively. The positions of the six N-linked glycosylation sites are indicated by green lollipops. Figure 9　Link module sub-groups. 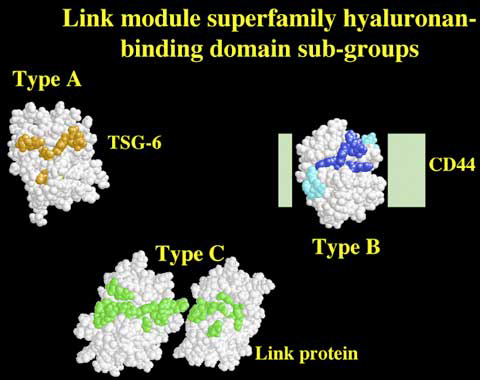 The Link module superfamily can be divided into three sub-groups (Type A, B and C) on the basis of the size of their hyaluronan-binding domains, which correlates broadly with the minimum size of hyaluronan (HA) recognized.7,8 Proteins highlighted in bold represent the archetypal member of each sub-group. LYVE-1 is likely to have a Type-B hyaluronan-binding domain as, like CD44, it contains an additional disulfide bond linking sequences flanking the Link module.2 The proteins shown in parentheses have not yet been demonstrated to be hyaluronan-binding proteins. Figure 10　The structures/models of the Type A, B and C hyaluronan-binding domains of TSG-6, CD44 and link protein. Only the tertiary structure of the Type A domain, a single Link module from TSG-6, has been determined to date. Residues that mediate the interaction with hyaluronan are colored in orange.g The Link modules shown for CD44 and link protein were modeled on the basis of the TSG-6 co-ordinates. In CD44 the structures of the N- and C-terminal extensions (light green boxes) are currently unknown. However, these are likely to form a sub-domain in intimate contact with the Link module.7 Amino acids of the CD44 Link module that are either critical or important for ligand binding are depicted in dark blue or light blue, respectively.6 In the Type C domain, the relative orientations of the two Link modules remain to be determined, and only one possible configuration is illustrated. The residues of link protein predicted to be involved in the interaction with hyaluronan are colored green (A J Day, unpublished). g DJ Mahoney and AJ Day, manuscript in preparation. 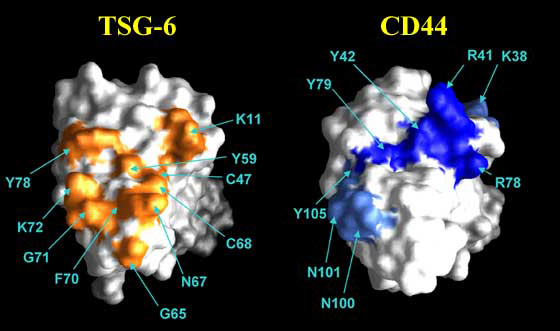 Figure 11　Hyaluronan-binding sites of TSG-6 and CD44. The hyaluronan-binding surface is comprised of residues brought together from different parts of the protein sequence. Clusters of basic amino acids, referred to as BX7B motifs (where B is either lysine or arginine and X can be any amino acid apart from acidic residues), have been implicated in the interaction between hyaluronan and RHAMM.e Although BX7B-like sequences are present in many other hyaladherins (e.g., IaI, SPACR, SPACRCAN, CD38, CDC37, P-32 and IHABP4; Figure 4), there are no data to indicate that they mediate hyaluronan binding in these proteins. This spacing of basic amino acids is extremely common in protein sequences. Therefore, the presence of a BX7B motif should not be interpreted as an indicator that a protein will bind hyaluronan, nor should it be assumed that this is necessarily the site of ligand-binding activity in a hyaladherin. Unlike other members of the Link module superfamily, the interaction of TSG-6 with hyaluronan is highly pH-dependent (Figure 13), with maximal binding at pH 6 and a dramatic reduction in activity as the pH is increased.4 This may serve to regulate the ligand-binding functions of this protein in tissues that have significant pH gradients, for example, in inflamed cartilage where TSG-6 is expressed (Figure 3). The structural basis of this unusual pH-dependency is not yet fully understood. However, it is clear that no detectable alteration in the conformation of the TSG-6 Link module fold occurs between pH 6 and 8.15 One possible explanation is that raising the pH changes the charge-state on a histidine residue, which leads to the loss of a critical binding interaction. Figure 13　Effect of pH on the hyaluronan-binding activity of four members of the Link module superfamily. CD44 is present on many cell types (e.g., lymphocytes) in a non-functional form that requires some activation process to acquire hyaluronan-binding capabilities. The regulation of CD44 activity is a complex issue with many factors potentially involved. These include the cell background on which CD44 is expressed, post-translational modifications (e.g., glycosylation), the splice isoform involved, cytoskeletal attachment, molecular clustering/receptor density on the cell surface and phosphorylation of the intra-cytoplasmic domain.d,14,16 Many of these have already been reviewed in this series,d and therefore only the role of glycosylation will be discussed here. As shown in Figure 8, the hyaluronan-binding domain of human CD44 contains six potential sites for N-linked carbohydrate attachment. Expression of this region in E. coli in a non-glycosylated form10 and site-specific mutagenesis16 indicate that glycosylation is not required at any of these positions for either correct folding or functional activity. It is, however, one of the principal mechanisms modulating the interaction between CD44 and hyaluronan, and there is differential glycosylation of the receptor depending on cell type and cell activation state. Removal of N-glycans by mutation of the first or fifth glycosylation sites, which are on the sequences flanking the Link module, can switch CD44 on an "inducible" cell background into a constitutively active form.16 This may indicate that particular carbohydrate structures are able to obscure the hyaluronan-binding site. Another possibility is that certain N-glycans prevent receptor clustering or lock the protein in a non-binding conformation. The molecular basis of CD44 regulation should become clearer once the tertiary structure of the hyaluronan-binding domain is known. For instance, this will reveal the positions of the glycosylation sites relative to the hyaluronan interaction surface. 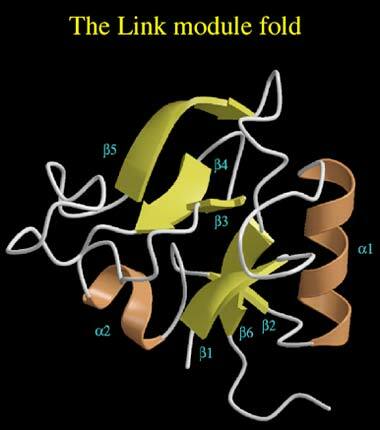 The Link module has a very similar fold to that of the C-type lectin domain.1 From Figure 14, it can be seen that these domains have identical topologies, with similar secondary structural elements and many residues in common stabilizing the hydrophobic core. Although the mode of carbohydrate binding is clearly distinct in these domains (i.e., the C-type lectin binds in a calcium-dependent manner, whilst the Link module-hyaluronan interaction is independent of metal ions), the positions of the ligand-binding surfaces are very similar.6 Both domains also mediate leukocyte rolling on the vascular endothelium during inflammation. Therefore, it seems very likely that they have a common evolutionary origin. The C-type lectin domain is present in many invertebrate proteins, whereas the Link module has only been identified in vertebrates, including sharks.17 This indicates that the Link module probably evolved from the C-type lectin domain sometime prior to the divergence of the cartilaginous fish and the bony fish/land vertebrates about 400 million years ago. Interestingly, Lee and Spicer18 have hypothesized that the ability to synthesize hyaluronan is a comparatively recent innovation in the evolution of metazoan organisms. For example, while a hyaluronan synthase has been found in the chordate Amphioxus, there are no such enzymes encoded in the Drosophila genome.h Therefore, it is possible that the Link module and hyaluronan appeared at approximately the same time during evolution. h See review by Spicer and McDonald in this series. 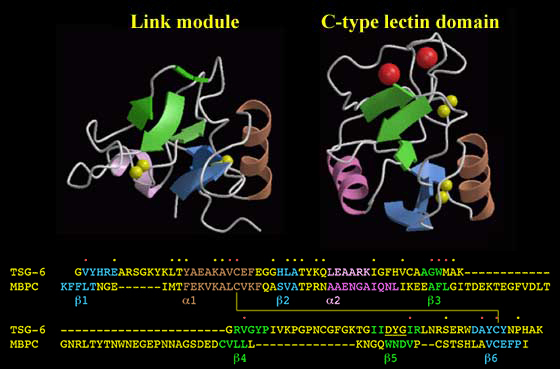 Figure 14　The Link module and the C-type lectin domain. These modules have identical topologies and a very similar organization of secondary structure. An alignment of the Link module from human TSG-6 with the C-type lectin domain from human mannose-binding protein C-chain (MBPC) shows that the secondary structural elements are found in equivalent sequence positions. The yellow/red dots denote the positions of amino acid identities and conservative replacements. The hydrophobic interiors of the two domains are similar, with core residues in the C-type lectin domain found at equivalent sequence positions to those in the Link module (red dots). This includes consensus cysteines Cys1 and Cys4, which are linked by disulfide bonds in each module. The major difference between the structures is the length of two loops. The Link module has a short loop connecting the ß3 and ß4 strands, whereas in the C-type lectin domain, there is a region of ~35 amino acids containing residues responsible for chelating two Ca2+ ions (large red spheres). Similarly, the 14-residue loop between the ß4 and ß5 strands in the Link module is shorter in the lectin domain. The ß5 strand of the Link module is shown in two parts as it is interrupted by a bulge (underlined) as illustrated in Figure 5. Significant advances have been made in the last few years in our understanding of hyaluronan-protein interactions. However, this knowledge is far from complete, and further studies to determine the three-dimensional structures of different types of hyaluronan-binding domains, and their ligand complexes, are clearly essential if we are to unravel the molecular mechanisms underlying the biology of this amazing polysaccharide. 1. Kohda D, Morton CJ, Parkar AA, Hatanaka H, Inagaki FM, Campbell ID and Day AJ. Solution structure of the link module: a hyaluronan-binding domain involved in extracellular matrix stability and cell migration. Cell 86:767-775, 1996. 2. Banerji S, Ni J, Wang SX, Clasper S, Su J, Tammi R., Jones M and Jackson DG. LYVE-1, a new homologue of the CD44 glycoprotein, is a lymph-specific receptor for hyaluronan. J Cell Biol 144:789-801, 1999. 3. Wisniewski HG and Vilcek J. TSG-6: an IL-1/TNF-inducible protein with anti-inflammatory activity. Cytokine Growth Factor Rev 8:143-156, 1997. 4. Parkar AA, Kahmann JD, Howat SLT, Bayliss MT and Day AJ. TSG-6 interacts with hyaluronan and aggrecan in a pH-dependent manner via a common functional element: implications for its regulation in inflamed cartilage. FEBS Lett 428:171-176, 1998. 5. Parkar AA and Day AJ. Overlapping sites on the Link module of human TSG-6 mediate binding to hyaluronan and chrondroitin-4-sulphate. FEBS Lett 410:413-417, 1997. 6. Bajorath J, Greenfield B, Munro SB, Day AJ and Aruffo A. Identification of CD44 residues important for hyaluronan binding and delineation of the binding site. J Biol Chem 273:338-343, 1998. 7. Day AJ. The structure and regulation of hyaluronan-binding proteins. Biochem Soc Trans 27:115-121, 1999. 8. Kahmann JD, O'Brien R, Werner JM, Heinegad D, Ladbury JE, Campbell ID and Day AJ. Localization and characterization of the hyaluronan-binding site on the link module from human TSG-6. Structure 8:763-774, 2000. 9. Peach RJ, Hollenbaugh D, Stamenkovic I and Aruffo A. Identification of hyaluronic acid binding sites in the extracellular domain of CD44. J Cell Biol 122:257-264, 1993. 10. Banerji S, Day AJ, Kahmann JD and Jackson DG. Characterization of a functional hyaluronan-binding domain from the human CD44 molecule expressed in Escherichia coli. Protein Expr Purif 14:371-381, 1998. 11. Grover J and Roughley PJ. The expression of functional link protein in a baculovirus system: analysis of mutants lacking the A, B and B' domains. Biochem J 300:317-324, 1994. 12. Watanabe H, Cheung SC, Itano N, Kimata K and Yamada Y. Identification of hyaluronan-binding domains of aggrecan. J Biol Chem 272:28057-28065, 1997. 13. Tammi R, MacCallum D, Hascall VC, Pienimai JP, Hyttinen M and Tammi M. Hyaluronan bound to CD44 on keratinocytes is displaced by hyaluronan decasaccharides and not hexasaccharides. J Biol Chem 273:28878-28888, 1998. 14. Lesley J, Hascall VC, Tammi M and Hyman R. Hyaluronan binding by cell surface CD44. J Biol Chem 275:26967-26975, 2000. 15. Blundell CD, Kahmann JD, Perczel A, Mahoney DJ, Cordell MR, Teriete P, Campbell ID and Day AJ. Getting to grips with HA-protein interactions. In: Hyaluronan 2000 (Kennedy JF, ed) Woodhead Publishing Ltd., Abington, Cambridge. 2001, in press. 16. English NM, Lesley JF and Hyman R. Site-specific de-N-glycosylation of CD44 can activate hyaluronan binding, and CD44 activation states show distinct threshold densities for hyaluronan binding. Cancer Res 58:3736-3742, 1998. 17. Schultz J, Copley RR, Doerks T, Ponting CP and Bork P. SMART: A Web-based tool for the study of genetically mobile domains. Nucleic Acids Res 28:231-234, 2000. 18. Lee JY and Spicer AP. Hyaluronan: a multifunctional, megaDalton, stealth molecule. Curr Opin Cell Biology 12:581-586, 2000.